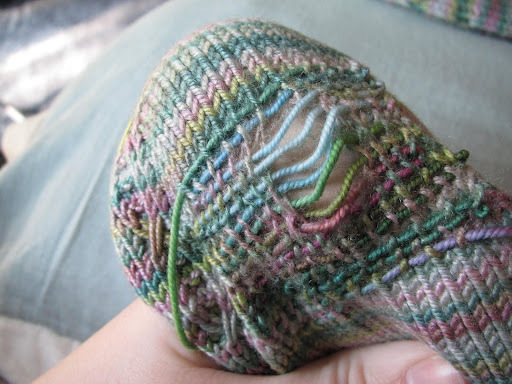 In the meantime, I mended some socks! These are the same ones I had to darn once before. They are the first pair I finished that I loved, so I wore the heck out of them and it is showing. I’ve learned new things about the way I walk: back of the heel and ball of the foot is where I wear through my socks! 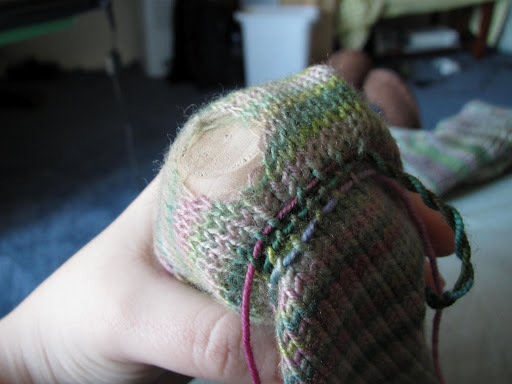 Center the hole over an annoyingly-too-small-darning-egg, begin weaving new yarn through one leg of each stitch in a row far beyond the edge of the hole. Keep weaving back and forth along the rows, and when you get to the hole just pull the yarn across it. When you cover the entire hole and beyond, turn the needle and begin weaving the yarn over and under the strands you just created. Snug each new strand up tight against the previous ones. 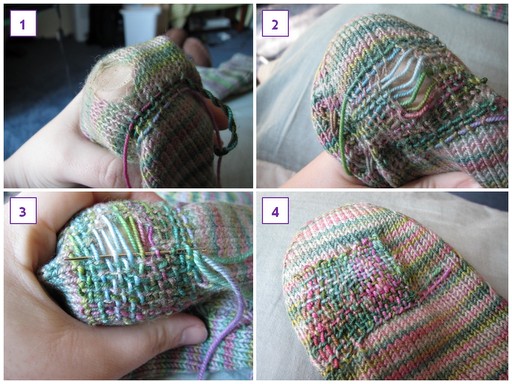 Admire your new crazy-patchwork-looking sock sole! It’s not super pretty, but the hole is definitely gone.